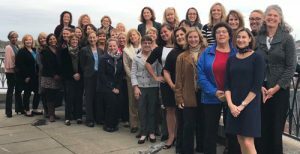 Forty women attended the Northern New England Women’s Investor Network (NNEWIN) interactive training on November 1st. Attendees traveled from Maine, Vermont and New Hampshire to learn from Jean Hammond, Co-Founder of Learn Launch; Barbara Clarke, Founding Principle of The Impact Seat and Founding Member of Astia Angels; and Sandra Stone, Chair Emeritus of Maine Angels. Jean Hammond walked us through an overview of the various forms of entrepreneurship, the most critical time for entrepreneurs to receive funding, different motivations for investing, investing as a group, executing due diligence and the cycle of the angel investing process. The audience, made up of both seasoned and potential first-time investors, created a lively training with their questions and shared experiences from their own angel investing explorations. Liz Gray then took a seat with Barbara Clarke, Sandra Stone and Jean Hammond to inspire the audience with a discussion led by women with a combined fifty-years of investing experience. All panelists are actively involved in increasing the number of women who both invest and receive investments. They all had their first deal, their first loss, their first mentoring experience. None of them suggested it’s their last! They have a vigor for supporting entrepreneurs who have a solid idea, the passion to see it through and the gumption to try. They were emphatic about supporting Live Free and Start’s goal to increase the number of women investors, and about supporting the individuals in the audience to take their next step into angel investing. Business card stock rose during the networking portion. Attendees were excited to meet the other people in the room and to learn about their drive to begin (or continue!) investing. This was a unique networking session in that forty women and two men attended to talk investing. All were encouraged to seek out opportunities at any of the angel groups in our states with open seats, and attend any of the technical events, investment conferences, and entrepreneurial showcases and contests. Thank you to our sponsors from Maine Angels, North Country Angels and Veris Wealth Partners! In 2015 Live Free and Start began talking about the need to increase the number of women investors in New Hampshire. Since that time we have held events and seen the number of attendees grow. We are delighted to see women and men from diverse industries attending the LFS women investing events. Some are motivated by a philanthropic leaning, or by love of entrepreneurship, others from watching their colleagues or partners having invested in the past. Early Live Free and Start women investor discussions quickly led to working with regional partners to educate and expand involvement from women in Maine and Vermont as well. As part of the NNEWIN training we provided the attendees with a list of activities in all states and all were invited with open arms to participate and learn together, across borders. The NNEWIN training attendees peppered us with a list of resources, from books, websites, angel investing groups, that can help people take the next step with their investing interests. There was also a strong interest that we offer webinars of various angel investing topics, followed by Q&As. Attendees want to start to get into the details of due diligence, as well as stay connected to other women taking their first, second or hundredth step in the process of angel investing. We have been thrilled with the level of interest and look forward to continuing to build the NNEWIN network.